It is part of the Daya 大雅 section, with some of the banxin 版心 bearing the title Shijing 詩經, some Daya 大雅, and some both: 詩經大雅. The fascicle is square, like the so-called “sleeve” editions (xiuzhenben 袖珍本) that were made to smuggle into examination cells, but seemingly not quite small enough for that purpose. However, faint traces of vermilion punctuation indicate that the book has indeed been used for study. 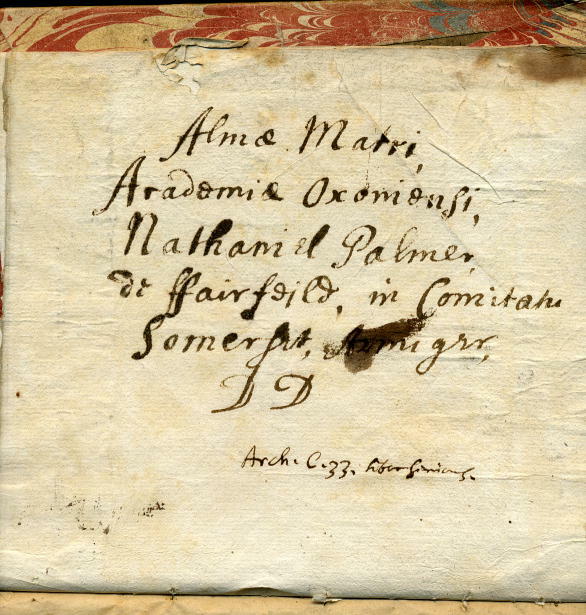 Almae Matri Academiae Oxoniensi Nathaniel Palmer de Fairfeild [sic] in Comitatu Somerset, Armiger, D.D. Nathaniel Palmer was born in Fairfield in Somerset in 1660, and died in 1718. He was educated at Winchester and Trinity College, having matriculated on 22 March 1678 at the age of 17. He was a Member of Parliament. This chronology makes it possible that the book came to the Library before Shen Fuzong’s visit in 1687, and the leaves are bound in a style characteristic of that time. However, it lacks the inscriptions by Shen Fuzong and Thomas Hyde (Bodley’s Librarian) on all the Chinese books that Shen Fuzong examined, nor is it in the list of these which Hyde compiled and recorded with their shelfmarks at the back of what is now MS Sloane 853 in the British Library. So it must have arrived after 1687. The main part of the inscription may be in the hand of the donor, but the shelfmark is in the hand of Thomas Hyde (and I’m grateful to Will Poole for confirming this), who left office in 1701 and died in 1703. So we have a 13-year window in which the book came to the Bodleian, and can confidently count it among our remarkable corpus of 17th century Chinese accessions. It is possible that other parts of this book are elsewhere in Europe, and it would be fortunate indeed if the first or last sections could be found, or at least a juan beginning, so that we could identify the edition properly. 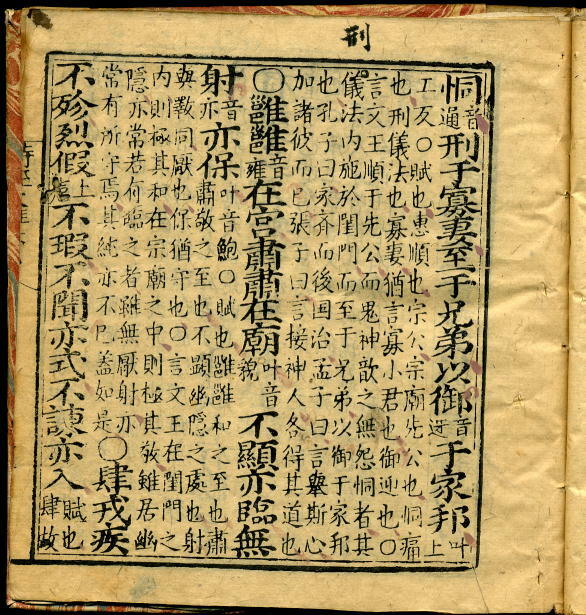 Works like this are classified as leishu 類書, which usually gets translated into English as “encyclopaedias”. In this case, the translation is appropriate, as the work is indeed an encyclopaedia in the western sense, albeit a rather downmarket one. Upmarket Chinese encyclopaedias are quite different, and for them we should translate the term leishu 類書 more literally: “classified writings”. These works do not consist of freshly-written articles on their subjects, but of extracts lifted directly from other texts, reproduced unedited and unchanged. 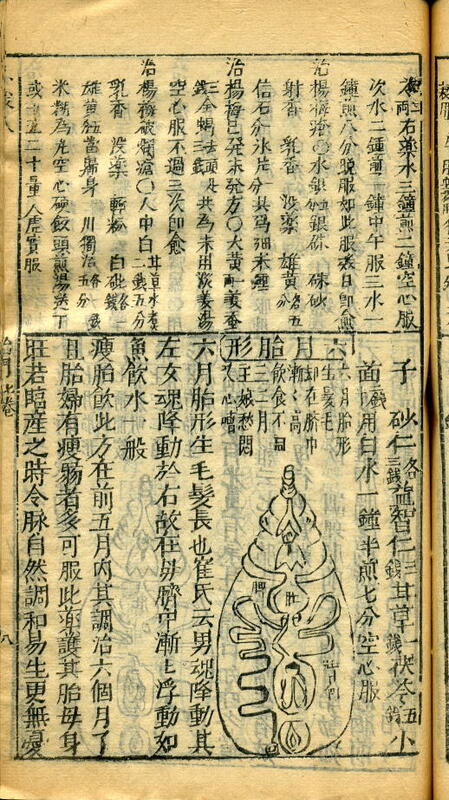 Some of them are therefore of immense value, as they preserve texts which are otherwise lost – the Cefu yuangui 冊府元龜 referred to in my post The earliest printing is a good example. Encyclopaedias in general and our collection of them in particular deserve a post of their own, and in future they will get one. For now I will return to Ten thousand treasures. In the title of the work, “Tianru Zhang xiansheng” 天如張先生 refers to the scholar Zhang Pu 張溥 (1602-1641, see Hummel, 52-53), “Tianru” being his courtesy name (zi 字); and he is said to have “carefully selected” (jingxuan 精選) its contents. A later edition (1758) in the Staatsbibliothek zu Berlin (Libri sin. 717) goes further and states quite explicitly at the beginning of the text of the first juan: 太倉天如張溥彙編. And the Bodleian edition has a prefatory tici 題詞 signed by Zhang Pu and in rather elegant cursive script. But these things nothwithstanding, it is most unlikely that Zhang Pu had anything to do with its compilation. It is even possible that the preface is fake, and that Zhang Pu had never even heard of the book. Printers and publishers were always using the names of well-known and respectable scholars to sell their books, and there are plenty of examples of this phenomenon in our collections. The term Shiqu 石渠 is laden with literary significance and continues the theme of enhancing the book’s respectability. It refers to the Shiquge 石渠閣, one of the two halls where documents were kept in the Former Han dynasty’s Weiyang Palace 未央宫 at Chang’an (the other library was the Tianluge 天祿閣). 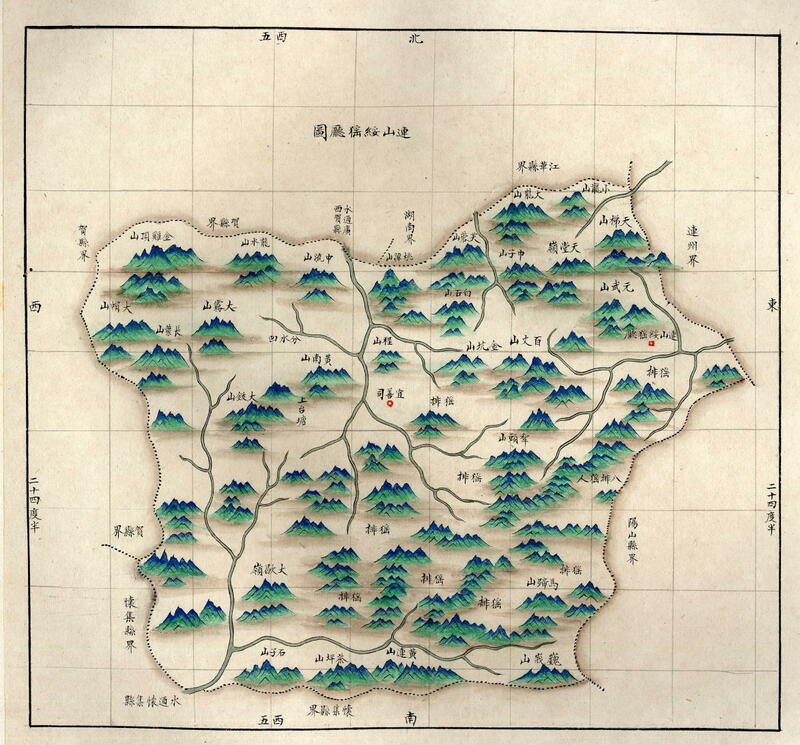 It was in the Shiquge that in 51 BC the Five classics 五經 of Confucianism were given canonical status. And there too, in AD 79 in the Later Han, the emperor Zhang 章帝 personally convened a meeting of scholars to discuss the various interpretations of the Confucian canon, and the proceedings were recorded by the historian Ban Gu 班固 in the book Baihutong 白虎通. 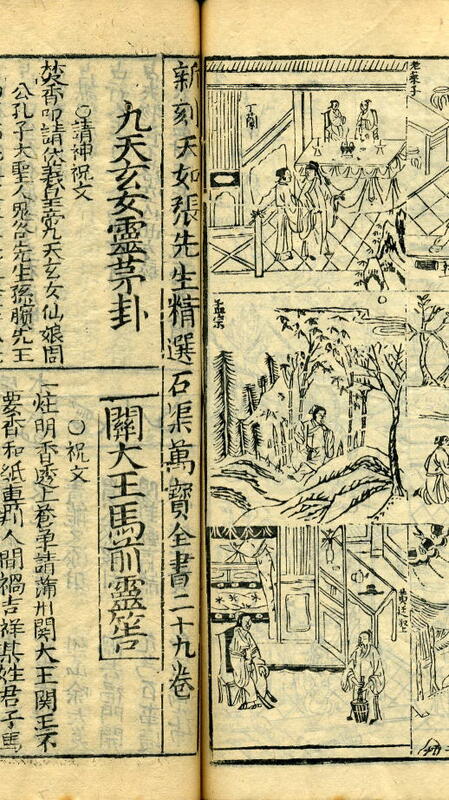 The Bodleian edition may turn out to be a unique surviving copy (海內外孤本), but a version printed six years earlier by the same printing house is recorded in the Japanese online union catalogue of old Chinese books 全國漢籍データベース, where we find an edition in 34 juan (four more than the Bodleian edition), printed by Cunrentang 存仁堂 in the 9th year of Chongzhen (1635). 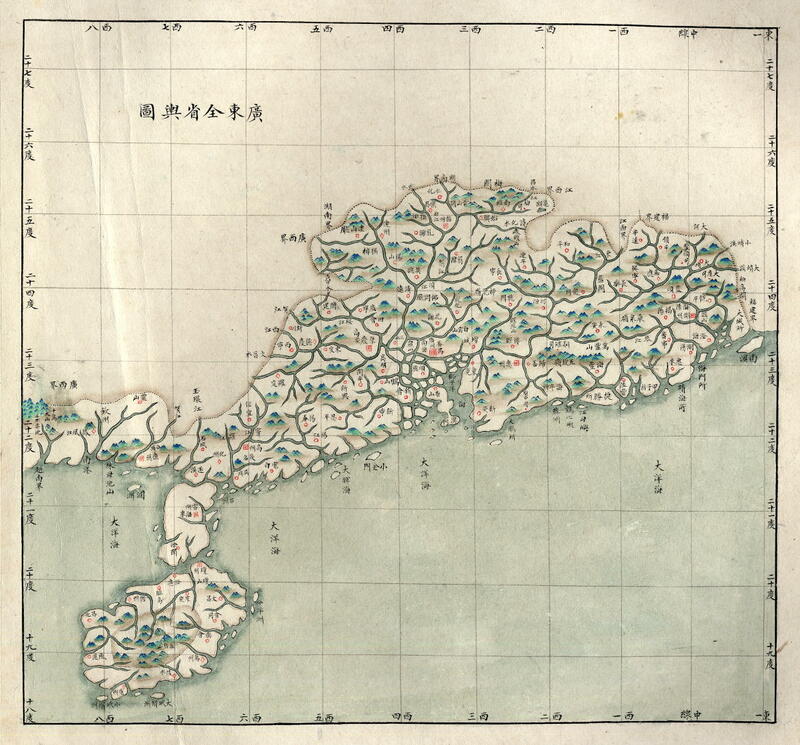 This copy is in Tokyo Metropolitan Library 東京都立図書館 (特7780). The Bodleian copy is in four fascicles, each held together by two paper screws. Covers were never added to complete a full “thread binding” 線裝, so that the book is almost certainly in the condition in which it was originally sold. Perhaps it never passed through the hands of a Chinese owner; it may have been bought personally by the foreigner who brought it to Europe, who would not have known how to complete the binding. Yet despite its pristine appearance, the work lacks juan 25-28. 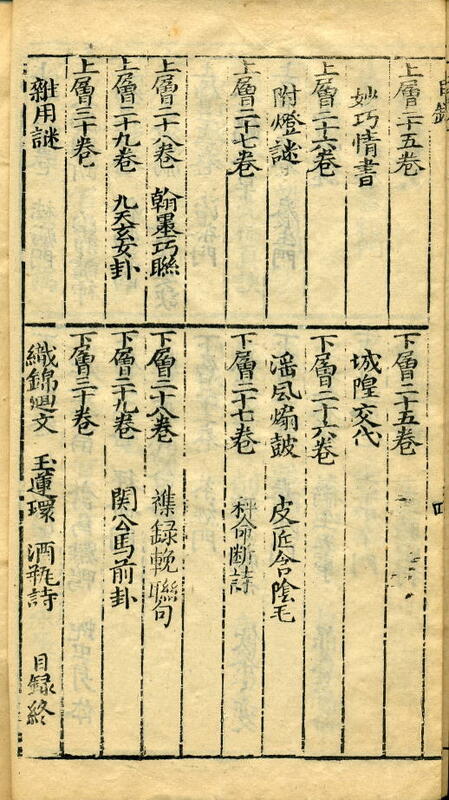 Where these should be, there are two leaves from a seemingly unrelated work (but printed on the same paper) illustrating the “Twenty-four filial examplars” 二十四孝, six illustrations juxtaposed on each half-leaf. I do not know why these four juan were not included. Perhaps the blocks were never cut for some reason, or perhaps the copy was printed after the fall of the Ming (the edition was only cut in 1641) and the four juan contained things that were no longer acceptable. I have so far been unable to locate the contents of these juan (as described in the table of contents) in the Berlin edition.